So, our Rodney Kinlaw has accepted an invitation to play in the Texas versus The Nation game. The game pits the collegiate all stars of Texas versus the best players from the rest of the country. The game will be played in El Paso and airs Saturday (Feb 2nd) on CSTV at 5pm (EST). I don't really know why I find this to be so hilarious - but I do. Paul Posluszny is going to Iraq - to visit with the US troops and watch the Super Bowl. He's part of an envoy of NFL players heading over to Iraq to tour a series of bases and show support for our men and women in uniform. I will admit that my heart sank and my brain started screaming "what?" "How!?" - when I first read the headline (HT: BCS Frenzy) - but when my vision cleared and I read on - my anxiety was replaced with pride and respect. Okay, I'll admit it - I only watched about 3 defensive series - and while I was watching, the North was winning - and doing fairly well on defense. Of course I missed Danny's interception and Ellis' safety - but hey - I did see Dan make a few solid tackles in the second half - and although he wasn't "in on" every play - he was "around" it - he led the defensive players in tackles with 9 - and won the Under Armour Award. It would seem that Danny maintained his "mid-to-late first round" draft status - which is good - there were plenty of players whose stock dropped during the outing. "They" say that his "con" is a lack of natural speed - but he has a quickness and intuitiveness that a linebacker needs - it doesn't matter how fast you run if it's in the wrong direction. Now - I realize that the South is lousy with uber talented kids and you have to pad the North team with kids from below the Mason Dixon line - just to make it a fair match up - but it really just appeared that the organizers had flunked geography - 9 kids from Southern California were on the North Squad - which is - by my calculation a bit more southern than say, Louisville, UK AND PITTSBURGH. Go to MgoBlog to nominate your favorite college football blog(s) in a variety of categories. Remember the day Grandma got hit by a rogue canopy, and she was fine, but Carter got a free ticket as a result? And PSUgirl asked - Which is worse, getting hit by a canopy or a can o pee? Another sign that it's the off season is college football bloggers trying to find something to occupy their time when pro sports, basketball, recruiting, player's legal woes, and a historically early Lenten season just aren't enough to satisfy their collective egos. Rocky Top Talk introduces the nomination process, while Orson Swindle, himself quite laden with the weight of virtual trophies, sets out the rules, etc for nominations over on EDSBS. Nominations will be announced on February 4th. So check it out and vote. So, the 2 teams with Penn State alum have advanced on to the Super Bowl - The New England Patriot and The New York Football Giants. While I'm happy that PSU will be guaranteed another "ring" - I was not rooting for either team. And having NY and NE in the Super Bowl has left me in a nearly impossible spot - I seriously can't stomach the "team of all times" Patriots (cheaters) NOR can I even entertain the idea of cheering on the Giants and whittle Ewhi Manning - (I live in a very strict anti-Manning zone) - But I guess that I'm going to have to root for the dang giants (bleh). So, I was seriously rooting for the Packers - although I was steamed that the announcers were alluding that the Giants' missed field goals were all Jay Alford's fault - Hello - he doesn't kick the ball. And then during one of the final drives - aj hawk whiffs on a tackle - and I'm all - eww - maybe I don't want the packers to win - and then they didn't. The Under Armour Senior Bowl is set for January 26th at 4pm - however, as it is airing on the NFL Network, only 46 people (me! me! me!) across the nation will get to see it. But, you can check out the website - Seniorbowl.com and read all about the participants, including one Dan Connor. During the football season I frequently visit Accuweather.com and their 15 day forecast feature. I realize that weather is an intangible in any outdoor sporting event, but my main concern is, always, tailgating weather. I get a weird little rush whenever a home game falls within the "next 15 days" - Although weather in State College is rarely predicted correctly or consistent. I find that Accuweather tends to have a football bias - that is - they will focus on any possibility for decent weather on a home game saturday - while other weather outlets will be predicting gloom and doom - good old accuweather always holds out hope. The worst weather season in my memory was 2006 - it was stormy for nearly every home game. The Akron game, of course was the hurricane with seriously cold miserable weather - on September 2nd!!!! But the weirdest day was the michigan game - it rained, flurried, was sunny, and featured serious wind gusts - many a pop-up canopy were lost that day. The most frustrating part was that it seemed that every Sunday was gorgeous - clear and sunny with warm temperatures and sometimes rainbows; it made for good traveling weather - but it was just cruel considering what we'd sat through the day before. We'd been pretty spoiled with the weather the previous 6 years or so - I guess we were due. Now that the football season is over, I sometimes check to see what the weather will be here in Philadelphia - but I usually don't - and I'm often surprised when I look outside in the morning to see what the weather is like. If it's raining I've inevitably left my umbrella at the office. If I dress warmly and bundle up then it's record high temperatures, in January (as it was recently). 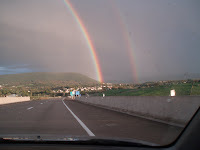 Every now and then I will check the weather in State College - and then I'll call my mom and ask if it did, indeed, rain that morning. But i rarely find use for the 15 day forecast - which is sad - It's 3 months until the Blue/White game - many weeks before old Elliot Abrams and co will be predicting rain or shine for that one. In the next three weeks college athletic directors across the country will be checking and double checking to make sure that their fax machines are well stocked with toner and paper and that the phone lines are in working order. Because February 6th is College Football's National Signing Day. The Recruiting season - it's crazy - fans get all riled up over who goes where and star rankings and the stats and such of little 18 year old kids - as always it's a competition - albeit 100% virtual. A "good" recruiting class can turn around a struggling program and give the fans some "hope". In the winter of (our discontent) 2004-05 things were pretty bleak at PSU. The team had ended on an "up" note by defeating michigan state handily, at home, knocking the spartans out of a bowl bid - but it had been a long and torturous five years - and then - this little kid from Maryland changes everything - just by picking up a baseball cap. #1 recruit, Derrick Williams, picks "The University of Penn State" - he was milking every nano-second of drama. Williams announced his choice, live, on ESPN - I was at work (no tv) so I streamed in the audio on the one PC we had in the office - I shouted, stood up and started galloping around the room - the support staff has serious concerns about my sanity. But that little spark was just what Penn State (especially the fans) needed to get back on track. Things haven't been perfect since then (and neither has DW), but it was definitely a turn in the right directions. A "great" recruiting class can instill some temporary pride - but be a total bust on the field. We have our own stories of recruiting regret - but EDSBS has a fine tale, recounting the career of one Xavier Lee. Personally, I'm happy with a class of 4 and 3 star players - generally, it has shown that they have talent which just hasn't been fully realized yet - 3 star Paul Posluszny would be an example, as would 4 star Sean Lee. But it still hurts to see other teams (especially the ones with craptastic records and reputations, such as ND, Miami, Pitt, FSU) getting 4 to 8 kids in the top 100 while PSU gets 2 (all linebackers, all the time). One player in particular has caught the attention of, well, everyone - his high school, camp, and post season play have cemented his spot atop the national rankings - and he grew up in PSU's backyard - but it's doubtful that he'll choose PSU. Oh well - Joe would just make him a tight end anyway. TE, 4*, Mark Wedderburn, Springfield, PA, 6-5/235 - Good height and size - he's a receiving TE - needs more experience blocking. S, 4*, D'Anton Lynn, Celina, TX, 6-1/177 - Texas? really? - Yup - although there has been some concern that he might "decommit" - he's still on the list. DE, 4*, Jack Crawford, Richland, NJ, 6-6/250 - New Jersey? really? actually - no - he's from London, England. He's been playing football for a year - but he's done quite well for himself (receiving over 10 scholarship offers - including tosu, um, bc and ru). DT, 3*, Pete Massaro, Newtown Square, PA, 6-4/245 - Standout from Southeastern PA. He had some troubles with injuries this season - but he, reportedly, has the height and frame required to excel. RB, 4*, Michael Shaw, Trotwood, OH , 6-0/187 - speedy and strong - weakness is blocking. OT, 4*, Deon'tae Pannell, Beverly Hills, MI 6-5/305 - recruited for offense, he has a quickness that may land him on the other side of the ball. RB, 4*, Brandon Beachum, Youngstown, OH, 5-11/220 - Beachum was a highly sought after RB - He joins his teammate, Michael Zordich, in the class of '08. DT, 2*, James Terry, Wilmington, DE , 6-2.5/294 - a standout his sophomore year, recording 10 sacks. Terry attended PSU football camps. WLB, 4*, Mike Yancich, Washington, PA, 6-2/219 - another western PA star linebacker - they used to grow quarterbacks there - I guess they all got the memo that JoePa switches them all to Defense anyway. Top 5 in his position. He was a big hit (har har) at the All Stars game. MLB, 4*, Michael Mauti, Mandeville, LA, 6-2/220 - Brother is a walk-on for the Lions - Participated in PSU football camp and fell in love with the place. Seems to have the same attitude and proclivity of a Pittsburgh raised linebacker - even if he is from Cajun Country. MLB, 4*, Michael Zordich, Youngstown, OH , 6-2/210 - So, yes, of course, he is the son of PSU (and NFL) great, Michael Zordich. But he's proven himself on the field and is ranked nationally in the top 5 at Middle Linebacker. OG, 4*, Matt Stankiewitch, Schuylkill Haven, PA, 6-4/290 - the first kid to commit to PSU - he's a top 10 ranked Guard with mad blocking skills (especially for the running game). So, there you have it - PSU's current recruiting forecast - One thing is blatantly obvious - Michael was a popular name in the late 80s and (yes) early 90s. Anthony Morelli has accepted an invite to the East-West Shriner's game. The game will air on ESPN, Saturday, January 19th at 7pm. So, football is winding down - There's a chance that no Penn Staters will be playing in the Super Bowl - Justin King is foregoing his 4th year of eligibility and entering the draft - and I all can think about is - What am I going to wear? In the fall I live in Navy - A navy, if not logoed PSU, outfit is mandatory for Fridays and Saturdays during football season and for the "really big" games, I'll wear PSU inspired garb all week long. Fridays at work, in the fall, are my PSU days. This is especially true if I'll be traveling up to State College that day - and of course there is the assortment of game day clothing for both home and away games. I've realized this winter that I have a lot of navy clothing - this is nothing new - what it new is the ratio of navy to other colors. Navy is, of course, a spring and summer color - sure people wear navy suits and overcoats all year long but, traditionally, it's kinda like white - even though many would suggest that the adage "no white after labor day" is dead and gone - just try going to Houston with white shoes in November - you'll recognize the looks. I've taken this rule to mean only navy accessories - as in shoes, handbags and such - I wear navy clothing all year long - although it does make me feel like I should be going on a cruise when I pull on my cabled cotton cardigan - oh well. One good thing about football season being over - and not really having a marquee basketball program (right now) (make those free throws!!!!) is that, given the right market (ie outside of Happy Valley), PSU stuff can go on sale. This weekend we found PSU "stuff" at various retailers for 50 - 80% off - Much was purchased. or not - it's the last Roundtable of the 2007-2008 season - the guys are finally bowing to the Writers Guild and giving it up - actually, they said something about it being too difficult to coordinate or whatever - yeah, put your index and middle finger together (HT: EDSBS - I'll use that one forever). But what do I know? I just pilfer the questions after the boys post them - It's not like i'm even in their little club or anything. But here are the final questions (doo dee doo doo, doo dee doo...) - as crafted by Black Shoe Diaries - with a little help from WFY. Let's start off with a positive note. When you look back on the 2007 season five or ten years from now, what will be your fondest memory? It doesn't necessarily have to be Penn State related. It was an exciting and sometimes shocking season - not boring - at all. As far as PSU goes - I was really happy to see Evan Royster and Rodney Kinlaw do well. Kinlaw was the work horse this season - but Royster is (hopefully) our future and after all the doom and gloom of the recruiting season - it was nice to see some spark in the backfield (then again, it's almost always nice to have some spark in the backfield). What should the Big Ten conference consider as its highest priority this off season? The B10 needs to repair it's reputation - the officiating scandals, the B10 network public relations fiasco add to the already laughable distinction that the conference has across the nation and with the national sports press. They need to clean up the problems - schedule quality out of conference games and win. Clark or Devlin? Whose camp are you in and why? Clark seems to be the man. He has the team's support and he's a charismatic guy. A lot of "message boarders" will tell you that he can't throw the ball - He may have some accuracy issues, but from what I've heard, he can throw the ball. If I thought that Devlin would be a "quick fix" then I'd be clamoring for the kid - but I don't see it happening - whoever is named as qb is going to have to fit into a very experienced offense - so which ever of the guys "fits" the best is the one I want. Which position not including quarterback is your biggest concern looking ahead to 2008? Who is the early favorite to win the Big Ten in 2008? Depending on who goes pro - tosu should be a better team next season. As we all know, 2007 was supposed to be a down year. How many Fulmer Cup points for Penn State this summer? hopefully zero - kids will always be kids but here's hoping that the coaching staff can inspire these kids to stay out of trouble's way this spring and summer. I will plan for next year's tailgates. My co-conspirators and I have a lot of great ideas for next season - so during the off season I will focus on practicing new recipes, testing new tailgating tools and searching the world for a new pop-up canopy that is just perfect but does not cost $500. should first be cleared with me - it would make the world a much happier place. My cousin, of whom I am quite fond, is getting married on the day of the Blue/White game. He and his intended will be getting married in Central PA - Centre County even - but I don't think I'll be able to go. I go the the Blue/White game every year - sure there were some missed games when I first moved away from State College - but not many and I haven't missed one in the last 9 years - It's just a special day. It's the practice tailgate - it's the practice game - It's a little piece of college football to savor during the bleak months. It's also a day that is always planned - it's always on the calendar (PSU/NCAA has shifted the date a few times, but) - I always know where I'm going to be the 3rd weekend in April - no surprises. And the tailgate is one of the 3 biggest of the year - sometimes the biggest - the free parking and game are a great incentive for the casual fan. But, my cousin and his family are also very special to me. I'd love to be there - any other spring, summer and/or winter weekend - heck I'd even go if it were an away game weekend - or maybe even a Coastal Carolina weekend (maybe - probably not). It's not as if they called up and asked "hey PSUgirl, we're trying to find a date for the wedding that doesn't interfere with hunting, fishing, trapping seasons and/or the Church calendar - any ideas?" - if they had, I'd have told them to consider other dates. Oh well. My dad missed quite a few family weddings/gatherings over the years due to football games - he and mom had an understanding - he would take her anywhere she wanted to go at any time and for any duration - but not during a Penn State football game. My family has scheduled weddings and events during football before - In 2002 my cousin scheduled a wedding anniversary party for her parents on the day of the Nebraska game - yes, Nebraska - this is a girl who went to PSU, married a Penn Stater and had a blue and white wedding. I had another little cousin who scheduled her wedding in the fall - on a home game day - when my one aunt told her that there was a game that day, she made some response about "no one caring about Penn State" - okay - it's fine - she was young and a Lock Haven grad and, obviously, didn't need me to be there. There have been a few friend and/or family weddings that occurred during away games - requiring earbud headphones and portable radios that actually pick up AM stations. At one wedding, Daddy and I sat in the back of the hall (we get married in halls in central PA), sharing the ear bud headphones - PSU was winning easily but the only time I got up was to go dance the Electric Slide (I am slave to it) - I then proceeded to tell (and show) my dad that the "slide" and being able to tie a knot in a cherry stem were the two things I learned in college - he answered "well, at least you learned something." By the way, neither of us were drinking. Two of my best friends have gotten married during (away) football games - interestingly enough, both games were against Indiana. The one got married in State College and had her reception at the Nittany Lion Inn - so we all watched the game in the lobby - seriously - everyone was out there. There will, undoubtedly be some family fall out if (when) I don't go - while "that side" of my family is made up of pro-PSU people - they don't really get the whole tailgating, sit in the stadium, Penn State Football is my reason for getting out of bed thing (odd, I know) - they're Steeler fans. But I did lay some ground work at the family holiday party - letting my aunt know that I probably wouldn't be able to be there - she seemed disappointed but understanding - We'll see. His wife-to-be is a really nice girl - she's put up with him so that's a true test of character right there. Their wedding reception is going to be a gold and black theme - yup - Pittsburgh Steelers and they're having a polka band. wah. It's the off-season - time to occupy one's self with things other than college football - it's difficult, I know. One immediate distraction is NFL football. Now, I follow Pro football during the college football season it's just usually on the radio driving home from State College - I consider myself to be an Eagles and a Steelers fan - I know - there have been long drawn out discussions (arguments) on how you can't root for 2 teams and you can't have a "transplant" team or whatever - I get it - I do - it's just I didn't grow up with a favorite pro football team - I grew up with Penn State. Living in Philadelphia makes me an Eagles fan by location. I do love the birds and their rabid fans - but, growing up in Central PA - we didn't have a Philadelphia tv station - and very rarely saw any Philadelphia sports - unless, of course, they were playing Pittsburgh. Nearly everyone in Centre County (and west) is a Steelers fan and if I want to still be on speaking terms with the family, I have to be up to date on the Stillers. So if neither PA team is playing (which, sadly is the current case), the next test is number of Penn State players - this weekend there will be six Penn Staters on playoff team rosters (playing on 5 teams). Seattle vs Green Bay - currently, Bobby Engram is the only Penn Stater suiting up for this game - that gives the edge to the Seahawks - 13 years is a long time too, Brett. Jacksonville vs New England - Isaac Smolko is a Jaguar and Kyle Brady (yes, he's still playing) is a Patriot. The Jags beat Pittsburgh - so that stings - but the Patriots are cheaters (not that Kyle is) - so I'm hoping for an upset of the pre-ordained gods of 2007-08. San Diego vs Indianapolis - Ed Johnson is a Colt and the Colts' coaching staff has PSU ties - this makes it difficult. One of the #1 rules of being a PSU fan is to root for the underdog - and I actually like San Diego - they need to draft some Penn Staters! and finally, the most odious game of the weekend - NY Giants vs Dallas - New York has two Penn Staters on their roster: Jay Alford and Kareem MacKenzie - but as a Philadelphia fan I do not root for the football giants- but they're playing the cowboys - a team without any Lions but with one TO - oh, it's horrible but I'll have to root for the giants to win an ugly game, so they can lose to Seattle in the Championship game. The NFL will only be on for a few more weeks - then there's Arena football - go Soul. QB Ryan Mallet will not be a Wolverine next year. He intends to enroll - somewhere - this spring - he will, perhaps, follow his recently fired coaches to Tennessee. Hmmm, I wonder who will be replacing him? check out PSU's final NCAA statistics and rankings. There's a lot to improve on - like, fumbles lost - but then there's some good stuff too - like, fumbles recovered. It's interesting to see where the team and the players rank - and you can get all flustered by checking out a certain bucknut's numbers. I wanted to put together a little fare thee well song list for our dearly departing quarterback. It's better for both of us this way - we just never really "clicked" - It's not that I don't like you as a person - I'm sure you're great - I just don't want you to be around anything that I care about. In wrestling, anyway! PSU is currently ranked #1 in the nation - nice. Check out the story on GoPSUsports.com. As the descendent of Central PAers - I come from rasstlin' stock - Back in the day it was quite the event - my uncles wrestled in high school - and in the olden (golden) days, State College High School would host their big meets in Rec Hall - my mother tells the funniest story(ies) about running up and down the bleachers and possible excitement induced incontinence. You can get lots of PSU wrestling info and analysis on The Nittany Line. So the Nittany Lions snuck into the USA Today Coaches' Poll at #25. The AP snubbed PSU (who finished behind uva on the list of alsorans) - but that's fine. So they get to finish the season (somewhat) ranked - that's nice. I flip back to the game - LSU won the toss - flip to "How I Met Your Mother" (I love that show) - back to the game - Wells is running through the line, down the field, and out running the entire LSU defense - Wow. How'd ya like that speed SEC? Crap - happy buckeye band people. Gee, I wonder if this will be like last year? Flip to Under the Tuscan Sun (which I'd never seen and is a dreadful film - but it's been 10 years since I was last in Tuscany - and I am feeling a little nostalgic) - Back to CBS and "The Big Bang Theory" (and an episode that I've already seen, but I watch any way). Flip back to the game - tosu is driving! Well. perhaps the commentators were correct and tosu came to play some ball. Tressel looks a little spastic on the sidelines - either he's just had 5 Red Bulls or he's kinda excited. Flip away - crap! I forgot that "Top Gear" was on - I love that show - yes, it's about cars. no, I don't currently own a car - but they're so funny - and British. So back to the game - at least for a little bit - LSU is doing well - every time I flip back someone in yellow and purple is jumping for joy - maybe I'll work on the "Christmas Puzzle" (which actually wasn't started until New Year's Eve) - it's devilishly difficult (a portrait of President John F. Kennedy, made up of thousands of tiny little pictures of President John F. Kennedy, and his people - all in black and white). TOSU has stalled on offense -this is not the calm organized offense that dominated most of the regular season - they look a little Penn Stateish. LSU is using just the right amount of trickery (like letting the punter get clobbered) to interrupt any bucknut momentum. Back to "Top Gear" - the lads are going to build a car - hilarious. Not sure that anything can be funnier than the day they built the convertible people mover (minivan) - but I'm game. I must move away from the puzzle - Eunice overload. Okay - the game - tosu can come back - it's only 14 points - okay, maybe they can't. A different episode of Top Gear (I adore BBCAmerica, btw) - testing the new Noble and vans - hilarity once more. Back to the game - Gatorade - I guess it's over - LSU is the national champion. I'm not sad that tosu lost - I'm rather relieved, actually - but it stinks that the pundits are calling them "outclassed" and such. LSU is the first 2 loss National Champion. BUT if we think about this - they'd have been 11-0-2 in the "olden days" - then again, without the overtime system, teams/coaches may have played differently - so on and so on. I guess that I'm not so good at measuring the mettle of the mascot - of course, a ton of bias was thrown into the mix - which, naturally, affects things. If you send certain energy out into the ether - the football gods are going to react. As I see it - the football forces knew where my true proclivity lay - and they adjusted accordingly. PSU needed some extra oomph to negate a 14 point deficit - kentucky required some intervention to settle their nervous offense - and old michigan needed some serious mojo to upend the One Who May Outshine Them All. So the pixie dust ran a little thin in some of the other match ups - it's understandable. I think it's just mean that the Armed Air Force didn't win. Kentucky made it interesting for a while - but they won - that's all that really matters. Oh well - it was still a good tribute season - Play 13! Eh, I picked the wrong Tiger - it happens. This was one of the roughest and hard fought bowl games, ever. Wiscy did well to stay in it - but Tennessee did better. Mizzou was impressive - they trounced the razorbacks. Thought this was going to be a UVA rout - but the raiders clawed their way back. Best game of the (new year's) day - the heisman curse lives. Sad - Illinois just made too many mistakes and couldn't recover. USC did this wacky thing - they capitalized on the Illini's errors - gasp. Disappointing game - I thought that it would be more competitive. I enjoyed this game very much. Kept saying "good for you west virginia!" Alrighty then - I really expected the Hokies to win easily - not so much. The Knights rolled - Ray Rice had a stellar game. Take off. So tosu lost, again and the SEC has yet another national championship. oh well. Is anyone excited about the championship game? I'm sure that fans in Baton Rouge and Columbus are interested to see if their respective team will be named champion - but it seems, that with the delay in the game and the manufactured controversy regarding the merit of the two teams - it just isn't that interesting. Would I be out of my mind excited if PSU were one of the two teams - yes, of course - I'd be over the moon with anticipation and fully convinced that my stellar team was a worthy contestant. But the "meh"ness of the teams has led to an "meh"ness for the game. Last year I really didn't care who won - except that I was super secretly rooting for Florida - mostly because I'd predicted, early on, that they'd win the Championship. This year I'm even less intrigued - it's the championship game - so I'll watch - I'm kinda hoping that it won't be a very "good" game - I certainly don't wish tosu well - but on the other hand, they are a representative of the B10 - so I'd rather they didn't humiliate themselves (again). not even a month - a monthlette - football games, nearly every night - and New Year's Day - when there's so much football your brain gets a cramp just trying to remember all the different stations that are broadcasting the games. And then it stops - as it will after Monday - sure there's the Senior Bowls and the NFL - but it's not the same, not competitive College Football. It's just gone. We amuse ourselves with the recruiting process, and watch some basketball - all the while there is that aching empty void, the place where diving catches, grass covered face masks, running games, standing in frost covered cow pastures, marching bands and stadium cheers live - it's your heart; it's college football. I guess there's the election and the olympics this year - but I don't think they're going to let me tailgate at the polling place. crying last night - and yeah, it stinks when your team loses - but I thought, and I said, out loud, "aw, are you crying oklahoma? well i remember when your team made me cry". oh so long ago - good times. So yeah, apparently this year's Spartan team just doesn't love one another enough. Houston seems to enjoy being ironic. TCU beat the coachless cougars. yeah! Winner winner beaver dinner. Everyone needs to remember that UConn really did lose to Temple. Wake wins. I was impressed by the bulldogs' defense - too bad I didn't pick them. Penn State forever - moldy old men! We Are! Well, there you go. Good job West by God Virginia. 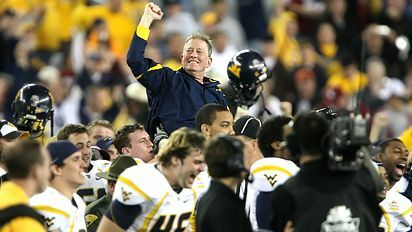 The Mountaineers' performance in the 2008 Fiesta Bowl will now be the #1 entry in the football dictionary for "playing with heart." The WVU offense ran up and down the field on the Sooner defense - running for long distances from the backfield and on short screens - which eventually left the blue and gold receivers so wide open that it looked like a game of "catch". The 'neer defense effectively kept the "explosive" Okla offense in check, only allowing points after their offense had created some serious padding. ...wipe their a$$ with glass, and laugh cause it itches! But - the 3 games that I cared about the most went our way. Penn State won the Alamo Bowl. Sure it wasn't against a top tier team - but all in all it was a good win. Kentucky won - although they tried to make it interesting - UK worked it out. michigan beat florida. Now, I don't particularly like um (at all) - but I was rooting for them to beat florida - if only to make the pundits (and America - per ESPN's poll) eat crow. Even if uf had pulled out a win, michigan played well and truly redeemed themselves (and, to some extent, the Big Ten). It was still a wacky game - Mike Hart fumbled? twice? how?